Pepperdine aims to provide campus-wide support to meet the unique challenges faced by international students. When Pengcheng "Dylan" Wang arrived on the Pepperdine campus from his hometown of Hangzhou, China, it was his first time overseas, away from the familiarity and comforts of home, and he did not speak English well. Now a senior international business major, Wang is one of nearly 1,000 international undergraduate and graduate students who attend Pepperdine each year. They come from all over the globe: Indonesia, Turkey, Saudi Arabia, Italy, Switzerland, South Korea, Uganda, Russia, Singapore, and many other countries. At Seaver College, the Office of International Student Services (OISS), in consult with the Seaver dean of enrollment management, manages the international enrollment for students in its undergraduate and graduate programs, while Pepperdine’s graduate schools manage their enrollment independently. The number of international students is expected to increase at all schools. For the Fall 2015 semester, Seaver College received nearly1,600 international student applications, the largest number ever. Traditionally, Seaver welcomes about 70 new international undergraduate students each year. More than 100 are anticipated this fall. Largely stemming from access issues in their home countries, the increase is due to parents in other countries seeking to invest in their children’s education by sending them to prestigious universities overseas, says Brooke Cutler, senior associate director of Admissions and International Student Services in OISS. Cutler and OISS assistant director Christie Culp often travel abroad to strategically meet those who are the best fit for and interested in attending Pepperdine. Those relationships are of great help to international students who face many hurdles on campus that their domestic peers do not, including adapting to a different culture, customs, food, and language, as well as responsibly managing the nuances of their F-1 student visa status, which is granted to them by the federal government and facilitated through OISS. Students like Wang and Jiang receive support through partnerships between multiple University departments, including OISS, Housing and Residence Life (HRL), the Inter-Club Council (ICC), and the Career Center, as well as from domestic students and faculty. The OISS hosts orientations for new foreign undergraduate students in the fall and spring to review federal F-1 regulations, equip students to proactively address challenges, provide resources, and discuss how to become involved and meet people. Social events are held to connect international students, including a soccer tournament. 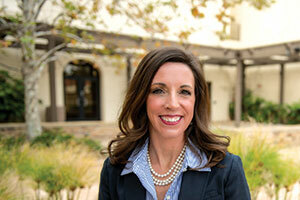 That’s where resident assistants (RAs) and spiritual life advisors (SLAs) like Jenna Wall come in. This past year was the first that an SLA was assigned to support new international students. Wall lived in White House, a first-year girls’ dorm, and reached out to all new international students scattered throughout undergraduate housing. Wall also learned that food is a big homesickness factor. “A number of international students drive into L.A. multiple times a week to eat foods authentic to their home country, or to stock up on big boxes of food to eat in their dorms,” she says. Many international students arrive on campus without necessities like blankets, pillows, towels, and storage units too bulky to bring by airplane. Working with outside vendors, HRL staff offers delivery services before students move in, so that necessities are in place. Another common challenge international students face is the steep learning curve in classes on such subjects as U.S. history, political science, and religion that the rest of the student body has a strong background in. 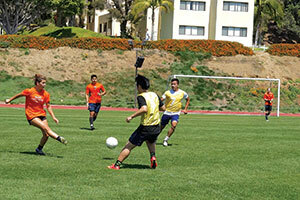 Pepperdine international students take to the campus soccer field each spring when the University hosts a tournament designed to bring students from different nations together. Faculty members reach out to OISS for assistance with issues related to foreign students in their classes. “Professors highlight trends they are experiencing in their classrooms and will ask me to help them understand,” Cutler says. Business is the most popular Pepperdine major for international students and many seek internships. OISS and Career Services will be partnering to offer a workshop series for international students on careers, networking, finding internships, and employment opportunities. Workshops will also assist students with cultural hurdles they may experience in the job market. The time difference makes it difficult to communicate with family and many students can only make the trip home once or twice a year because of the distance and expense. During holiday breaks when American students return home to spend time with family, most international students remain on campus. The HRL office provides support including working with RAs and SLAs to reach out to international students. As if these weren’t enough hurdles to conquer, then there are the complex regulations. Prior to coming to the U.S., students complete a lengthy application process for a special student visa, which comes with many requirements and restrictions. Students must show sufficient financial support, maintain full-time student status throughout their education, and intend to return to their home countries upon completion of their education. Additionally, off-campus employment is restricted and on-campus jobs are limited. They do not qualify for federal student aid, and unless they receive some merit or international scholarship, most are paying full tuition and at least the required two years of on-campus housing. A department dedicated to serving international students, and a team of campus partners committed to their success, is essential to helping many newcomers navigate the extra hoops they have to jump through. “We look forward to further enhancing our collaboration in the months and years to come,” Cutler says. While there are difficulties adjusting to a markedly different life in the U.S., international students bring many benefits with them to Pepperdine, in and out of the classroom, on and off campus. Chelsea Christian, a senior interpersonal communications major from the Pacific Northwest, is a lead intern in the OISS and works closely with many foreign students. Those conversations extend far beyond campus gates. Pepperdine student and alumni groups are meeting in other countries, and incoming students are being connected with current students from mutual countries. Sergio Gallardo, of La Paz, Bolivia, intends to use his education to improve his home community. The junior music major, who is studying classical guitar, plans to return to his home country to develop a university music department or conservatory.